Nicolai Sehested today cast aside any idea that Taylor Canfield and US One were the event favourites, ruthlessly dispatching the American team 3-1 in their Quarter Final match at the World Match Racing Tour Fremantle. The young Dane is showing no fear of any opponent, and nor should he, the way he is tearing around the track in the M32 multihull this week. To look at his crew’s devil-may-care attitude to throwing the boat around, you would never know the Viking raider was racing this challenging boat for the first time this week, with a team that have never sailed together before. Canfield on the other hand has been racing the M32 for more than a year but couldn’t match Sehested off the high-speed reaching starts, nor could the 2013 World Champion catch the great Dane around the race course. The simplest Quarter Final victory went to Great Britain's Ian Williams who despatched Sweden’s Mattias Rahm 3-0 in a superior performance by the GAC Pindar crew. As the reigning and six-time World Champion, Williams was the undoubted master of the slow keelboats, but he’s proving to be a fast learner in the multihulls. “The fleet is improving so fast that if we’re only as good as today, we probably won’t be good enough tomorrow,” said Williams, who faces Sehested in the Semi-Finals. “Nicolai is very dangerous, his team beat us in Poland last year. We’ll take on board the lessons from today and see what we can do.” The historical statistics are etched in Sehested’s memory too. He hasn’t lost to Williams in the past 12 months, even if those matches were in keelboats, nothing like the M32. Jones gave Yann Guichard a few scares, especially when the Frenchman made an unforced error during one pre-start. “We were going really fast downwind, and I tried to gybe on the foil. We capsized, but no damage, everyone was OK on board. Five minutes later we’re back upright and ready again. I’ve never seen this before on this size of boat. Normally you break something when you capsize, but not today.” Although Jones won that race by default, Guichard quickly reverted to business as usual. Even though he has next to no experience in the M32, his deep background in racing all kinds of multihulls - from Olympic Tornados to the giant 40m, round-the-world Spindrift 2 - equips Guichard with a natural feel for what makes the M32 tick. Even against the wily Wallén, he’ll be fast and dangerous. So tomorrow it’s Williams v Sehested, and Wallén v Guichard. With the pre-event favourite out of the running, Canfield was asked who he’d back for the overall win, for the US$33,000 prize money tomorrow afternoon. “Sehested. He was fast against us today, and I think he’ll do it again tomorrow.” Will Canfield’s confidence be a curse on the Dane? 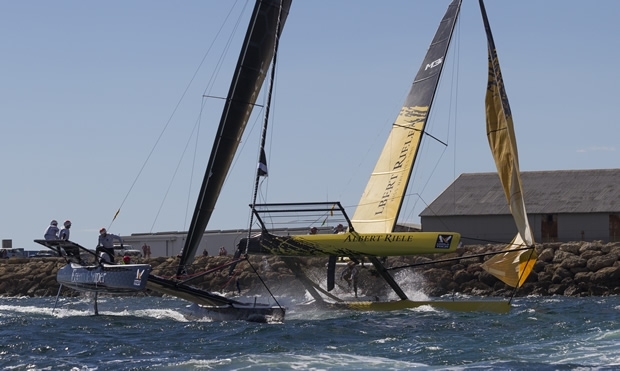 Or is Canfield right to foresee the young Viking doing another smash-and-grab assault on his more experienced competitors on the final day, the climax of the World Match Racing Tour Fremantle?